ATHENS, Greece -- A Greek retiree shot himself dead in the busiest public square in Athens during morning rush hour Wednesday, leaving a note police said linked his suicide with the country's acute financial woes. Hours later, more than 1,500 anti-austerity protesters gathered in the square, responding to social media calls for peaceful demonstrations accusing Greek politicians of driving people to despair with harsh cutbacks implemented to secure vital international bailouts. Limited scuffles broke out between the protesters and riot police, who used a small amount of pepper spray to repel youths throwing bottles of water at them. The 77-year-old retired pharmacist drew a handgun and shot himself in the head near a subway exit on central Syntagma Square which was crowded with commuters, police said. The square, opposite Greece's Parliament, is a focal point for public protests. The incident jolted public opinion and quickly entered political debate, with the prime minister and the heads of both parties backing Greece's governing coalition expressing sorrow. "A pharmacist ought to be able to live comfortably on his pension," said Vassilis Papadopoulos, a spokesman for the "I won't pay" group. "So for him to reach the point of suicide out of economic hardship means a lot. It shows how the social fabric is unraveling." Greece has relied on international rescue loans since May 2010. To secure them, Athens implemented harsh austerity measures, slashing pensions and salaries while repeatedly raising taxes. But the belt-tightening worsened the recession and led to thousands of job losses that left one in five Greeks unemployed. "As a Greek, I am truly shocked," Dimitris Giannopoulos, an Athens doctor, said before the protest. "I am shocked because I see that (the government is) destroying my dignity ... and the only thing they care about are bank accounts." Police said a handwritten note was found on the retired pharmacist's body in which he attributed his decision to the debt crisis. According to a text of the note published by local media, the man said the government had made it impossible for him to survive on the pension he had paid into for 35 years. "I find no other solution than a dignified end before I start searching through the trash for food," read the note. Police did not confirm whether it was genuine. Greece has seen an increase in suicides over the past two years of economic hardship, during which the country repeatedly teetered on the brink of bankruptcy. Police did not release the pharmacist's name and offered few other details. By Wednesday evening, dozens of written messages had been pinned to the tree under which the man shot himself, some reading: "It was a murder, not a suicide," and "Austerity kills." Hundreds of protesters made their way across the street from the square to outside Parliament and the Tomb of the Unknown Soldier, chanting: "This was not a suicide, it was a state-perpetrated murder" and "Blood flows and seeks revenge." Dozens of riot police stood guard. Papadopoulos, the protest organizer, said the suicide shows Greeks can take no more austerity. "This suicide is political in nature and heavy in symbolism. It's not like a suicide at home," Papadopoulos said in a telephone interview. "There was a political suicide note, and it happened in front of a clearly political site, Parliament, where the austerity measures are approved." Prime Minister Loucas Papademos issued a statement as protesters gathered at the site of the suicide. "It is tragic for one of our fellow citizens to end his life," he said. "In these difficult hours for our society we must all - the state and the citizens - support the people among us who are desperate." Government spokesman Pantelis Kapsis described the incident as "a human tragedy," but said it should not become part of the political debate. "I don't know the exact circumstances that led that man to his act," Kapsis said. "I believe we must all remain calm and show respect for the true events, which we do not yet fully know." 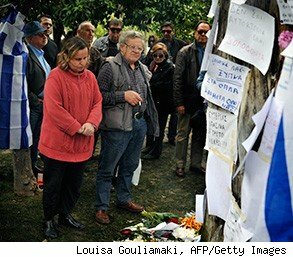 Evangelos Venizelos, leader of the Socialist party, said the suicide "is so overwhelming that it renders any political comment unbecoming and cheap." "Let us reflect on the condition of the country and of our society in terms of solidarity and cohesion," said Venizelos, who served as finance minister for eight months before resigning to lead the Socialists. Conservative party head Antonis Samaras said the tragedy highlighted the urgency of getting Greece out of the crisis. "Unfortunately, this is not the first (suicide)," he said. "They have reached record levels."